With multi-service wallet functionality, you can allocate a common balance for your prepaid customers and allow them to use it for a subset of different services. Similar to how regular service wallets work, you can identify the service usage as either being monetary or measured by units with multi-service wallets. For monetary multi-service wallets, service usage is calculated based on the tariff rates defined for each service. For unit-based multi-service wallets, usage is calculated as within this wallet’s service pool. To encourage customers to use multi-service wallets, you can introduce flexible top-up schemes. Then when a customer tops-up their multi-service wallet, they can use its balance for any of the services included in the wallet and their main balance will remain intact. 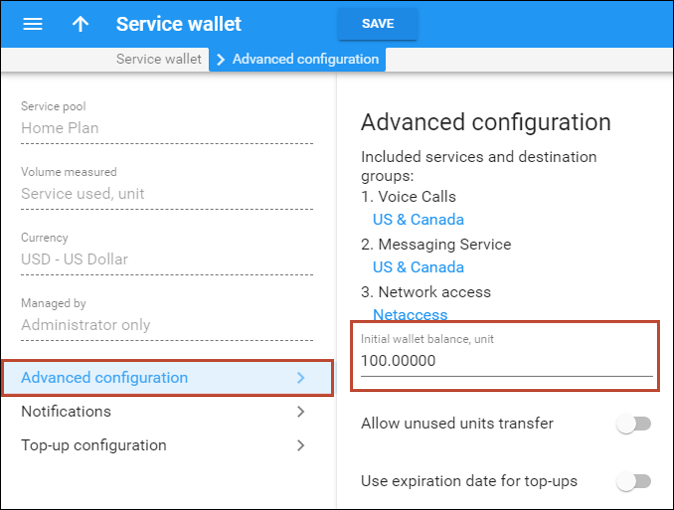 This chapter shows you how to configure PortaBilling® to provision several services within a common service wallet balance. · the top-up options are: 100 units – $5 with 10 days’ lifetime; 300 units – $15 with 20 days’ lifetime; 500 units – $40 with 30 days’ lifetime. The checklist below assumes that you have already configured the basic SIP service according to the instructions provided in Basic Residential VoIP Service, the Messaging service according to the instructions provided in the SMS Services handbook and the Internet provisioning according to the instructions provided in theBroadband Internet Access Services section. 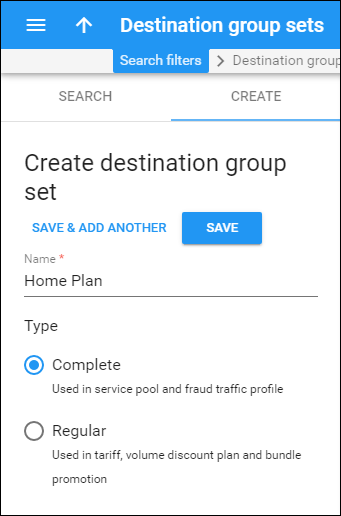 A destination group set is a logical container for destination groups that are used for the same purpose. At this point, it is necessary to create a complete destination group set. · Type – Select Complete match. 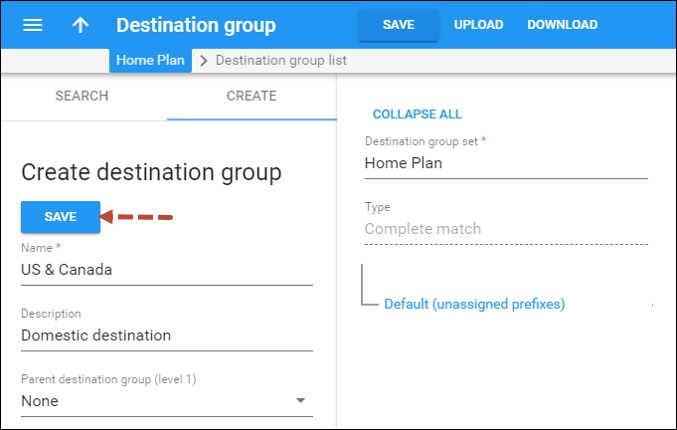 Every complete destination group set contains the Default group that includes all the prefixes available in the system. 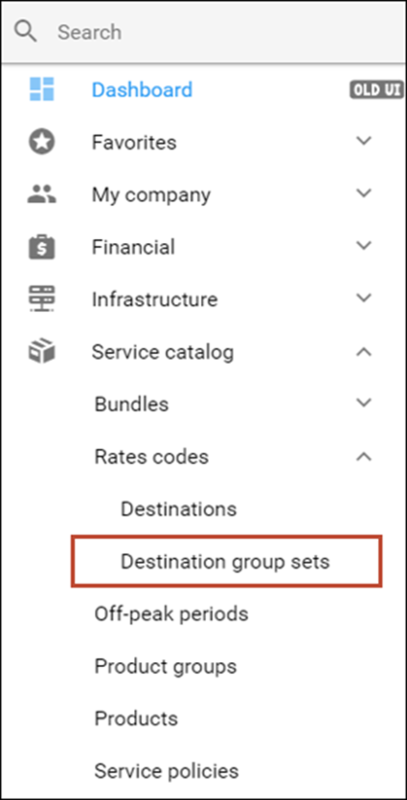 To narrow down the prefixes to which the service wallet will apply, it is necessary to add destination groups to the destination group set. 2. On the Create destination group panel, type in the destination group name and a short description. Repeat steps 2-3 to create more destination groups within this destination group set (e.g. for Internet access). 1. On the Destination group page, click on the Default group. 2. This brings you to the Destination list panel. 3. 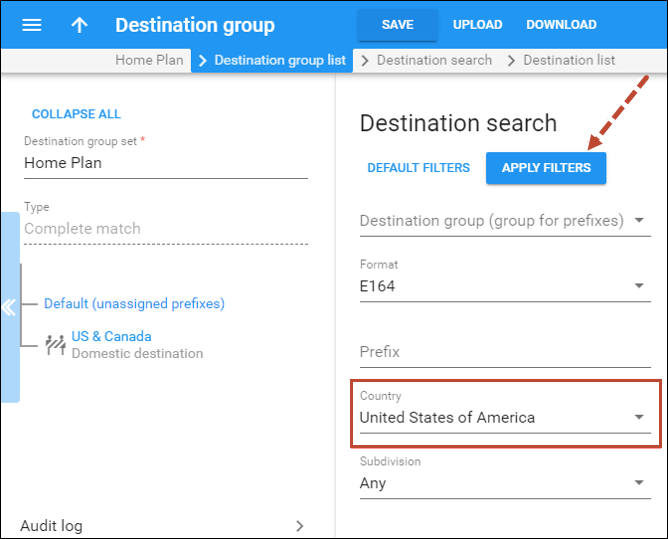 To display the available destinations, use one of the search filters (Format to search by format, Prefix to search by prefix, Country to search by country name, Description to search by a destination description) and type in the country name or master phone prefix. Click the Apply filters button. 4. 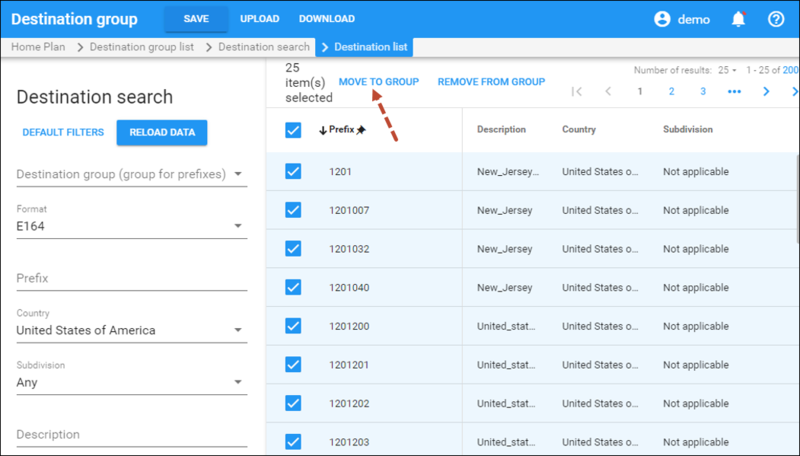 When you see a list of the available prefixes, select the ones you would like to include in the destination group, and then click the Move to group button. 5. Select the destination group and click Move. 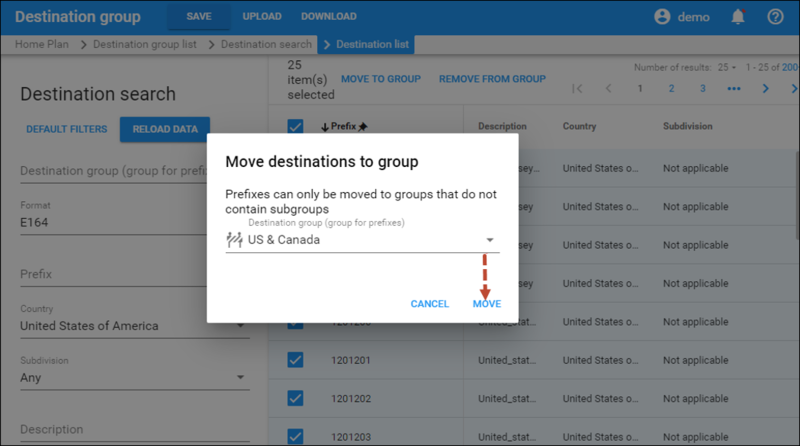 The selected prefixes will be added automatically to the destination group. 6. Repeat steps 1-5 to move the NETACCESS prefix to another destination group. To narrow down the available services within a common balance, it is necessary to consolidate them into service pools. · Type – Select Service pool. · Rating base – Select quantity (units). · Base unit – Leave the default value here. · Destination group set – Select the previously created destination group set. · Service – Select the service you want to include in the Service pool (e.g., Voice calls, Network Access, Messaging service). · Ratio – Specify the cost for the service usage (e.g. 1 minute = 3 units). 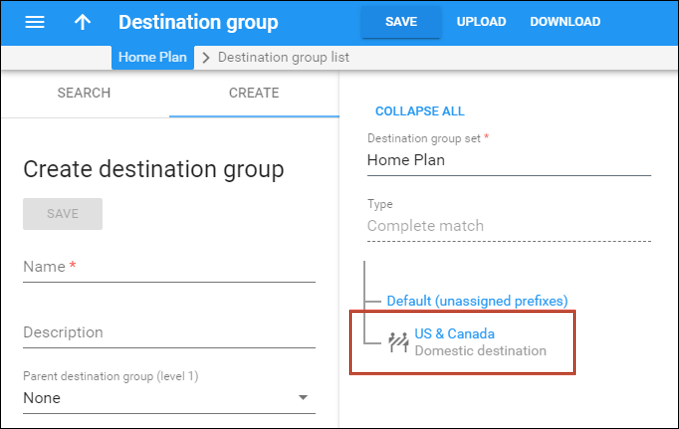 · Destination groups – Select the previously created destination group. · Click the Add button to add more services and destination groups. 4. Сlick the Save button. A volume discount plan contains definitions for all discounts or service wallets applicable to users. · Name – Type in a short name for the volume discount plan object; this is the name you will see in the select menus (for example, Home Plan). · Currency – Choose which currency pricing information is defined; a volume discount plan can only apply to accounts and customers using the same currency. NOTE: The currency for the volume discount plan may be chosen only once (at creation) and cannot be changed later. · Apply discounts to – Select Service pool here. · Description – Type an extended description for this volume discount plan. 4. While on the Edit discount plan panel, click the VDP configuration link. · Type – Select Service wallet. · Service pool– Select Home Plan here. · Volume measured – Choose Service used, unit. 1. On the Service Wallet panel, go to Advanced configuration. In the Initial wallet balance, unit field, specify whether your multi-service wallet has a zero or some other initial balance. Specify what the initial balance amount is. · Fee – Specify the price you charge end users for the top-up. · Volume, units – Specify the top-up amount (e.g. 100 units). · Click the Add button to add other top-up options (for 300 and 500 units). 3. In the Notifications section, select which notifications PortaBilling® will deliver to end users. Please consult PortaBilling Help for a detailed description of available options. 4. Click the Save button to save the multi-service wallet configuration. 2. On the Search products panel, filter the product you wish to edit and click the product name. 3. On the product panel, click Charges, General info. 4. 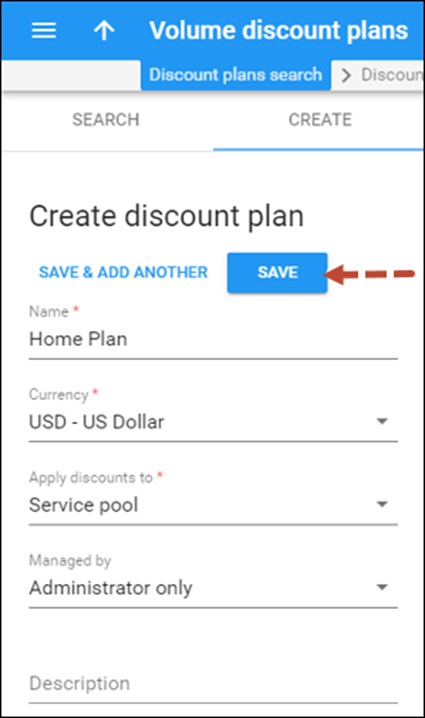 In the Default discount plan select menu, choose the volume discount plan you created earlier (in our example, Home Plan). From here on in this volume discount plan will be applied automatically to all accounts with this product assigned. 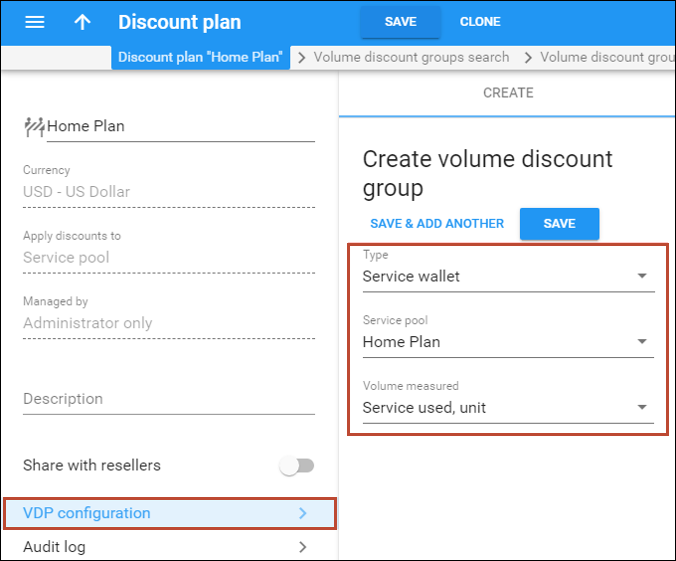 Please consult the Assign a Volume Discount Plan section of the Creating a Service with Volume Discount Plans handbook for other ways to assign a volume discount plan.